When I saw the M-Audio Trigger Finger Pro at this year’s NAMM Show, its stunning good looks made quite an impression, but I had no real idea about its underlying functionality. It has RGB LED pads, a slick silvered look with blue lighted accents, and a large LCD screen – but that’s about all I knew. At the time, I had no idea that the Trigger Finger Pro would become one of my favorite studio products of 2014. More than just a flashy box of buttons and knobs, the Trigger Finger Pro is an innovative new groove box that marries hardware and software in the most intuitive and exciting way possible. With or without a computer, the Trigger Finger Pro provides great utility in the studio, making it a flexible and affordable must-have for today’s producers. On the outside, the Trigger Finger Pro has got some edgy good looks. The polished metal face, the bright blue lighted buttons, the LCD screen, and the now ubiquitous RGB drum pads all make for a sleek, modern look. Although lightweight, the Trigger Finger Pro feels sturdy, and comes with a rigid metal stand to help set up your device in a variety of orientations. The pads are soft, sensitive, and a joy to use. No slamming the buttons just to hear a drum hit, yet still sensitive enough to velocity and pressure to really let you put some humanity into your sound. One of the Trigger Finger Pro’s most attractive features, beyond providing a buttons-and-knobs interface for your favorite DAW, is the integrated Arsenal software which really makes this unit shine. Arsenal and the Trigger Finger Pro together make for a Maschine-like groove production suite. 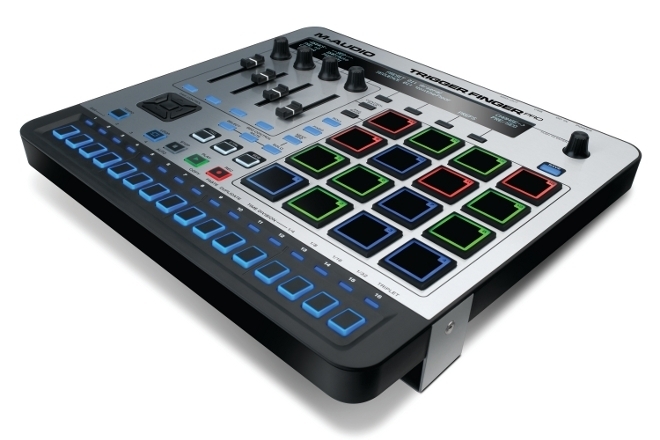 The Trigger Finger Pro provides a physical workspace and the MIDI sequencing, while Arsenal provides the sound engine. Sure, you can use other VST instruments with the Trigger Finger Pro, but Arsenal makes sure that you never have to. More than just a sample aggregator, Arsenal curates all the VST instruments you already own into one unified library of presets and sample loadouts. Arsenal was designed to automatically map your Trigger Finger Pro’s MIDI signals to a huge diversity of popular production plugins, meaning you never have to touch “MIDI Learn” again. Arsenal also reads in preset names and stores them in a common bank with tags and filters, meaning you don’t need to leave the Arsenal window to access Kontakt, Sylenth, Drumazon, or any other virtual instruments that might be in your collection. I had never imagined an application grouping my presets and automapping my VSTs this well before, but now I can’t live without it. The Trigger Finger Pro also comes bundled with two virtual instruments to get you started – AIR Drums and the Hybrid 3 synthesizer. The Hybrid works really well with the Trigger Finger Pro’s sequencer to lay down some really cool sequenced basslines, 303-style. Most people will probably use the Trigger Finger Pro for rhythm generation, though, and luckily the included drum software does not disappoint. AIR Drums is well integrated with Arsenal right out of the box, and with three bundled high-quality sample packs, you’ll have enough to get started (or expand your sample base) in any genre. There are 16 sample packs provided by Toolroom Records, Prime Loops and Anomaly. As I mentioned briefly before, the Trigger Finger Pro handles all sequencing and MIDI generation, whereas Arsenal merely provides the sound. This simple fact is huge, and is another massive benefit of the Trigger Finger Pro. All pattern generation and storage can be done in hardware, which means you can sequence hardware synths and drums without the use of a laptop, or store sequences on board for use on multiple devices. The 16-step sequencer (or up to 64-step, depending on how many bars you’d like) is laid out linearly, channeling the Roland TR-x0x series, and thanks to four pad banks, up to 64 samples, synths, and loops can be sequenced at once. And thank goodness they didn’t forget to include swing! For all of the reasons listed above, from the intuitive workflow to the step sequencer to the powerful bundled software, the Trigger Finger Pro is a welcome addition to any studio. The indispensable Arsenal combined with the bundled instruments are a great boon to producers everywhere, and are almost as valuable as the killer hardware itself. The Trigger Finger Pro is not just a computer peripheral, but a powerful standalone MIDI sequencer unlike anything else on the market. Finally my analog synths and drum machines have a friend to play with.